The Carlisle SMT (Surface Mixed Tube) 148 Style Burners, and the standard SMT burners work in similar fashions. Both styles are totally surface mixed with virtually no possibility of flashback. Both have the ability to run multiple fuel gas/oxygen mixtures, such as propane, natural gas, and even hydrogen. The main difference between the two styles is their method of construction. 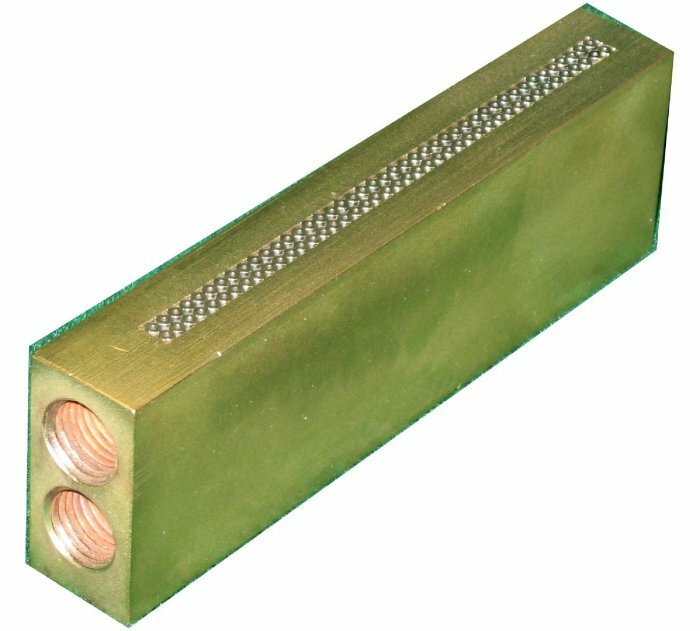 While SMT burners are manufactured from a stainless steel pipe, the SMT 148 Style Burners are constructed from a solid piece of rectangular metal. It is a much more durable construction than the pipe system, and offers the option of brass or stainless steel construction. In addition, the 148 Style allows for more than one row of tubing. Two rows can easily be added with a negligible difference in body size. When a 148 Style is manufactured with three rows of porting, a different type of construction is used that resembles the face of a PK 1885-D burner. The SMT 148 Style Burner is capable of producing approximately 11,000 BTU/hr. per inch. This figure is doubled and tripled for two and three rows respectively. The 148 Style is offered in sizes ranging from a 0.5" flame space to a 6" flame space. It is important to note that flame space does not reflect the burner's overall length.